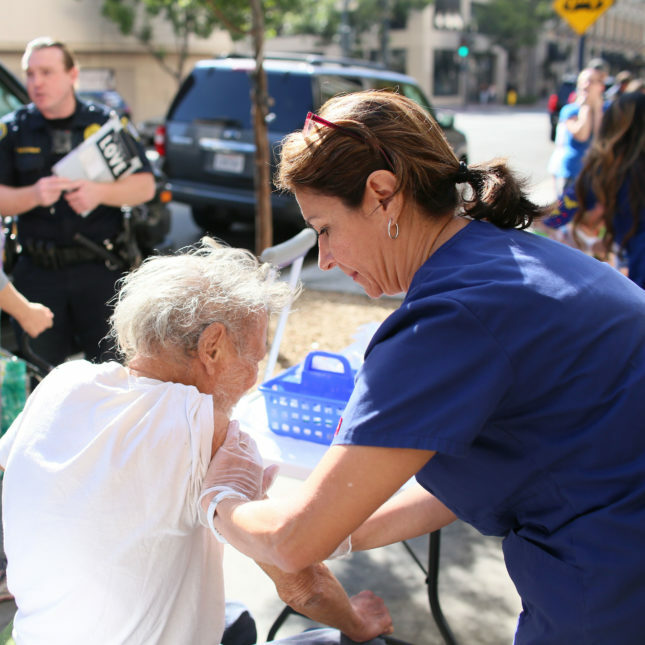 Nurse Paulina Bobenrieth gives a hepatitis A vaccine to a homeless person in downtown San Diego. SAN DIEGO — The hepatitis A outbreak now roiling this well-heeled, coastal city may have had its roots in a baseball game — when the city cleaned up for the 2016 All-Star Game by pushing its homeless out of the touristy areas downtown and into increasingly congested encampments and narrow freeway onramps just east of downtown. The lines of tents stretched for blocks. At the same time, the city was locking and removing bathrooms to help control the rampant drug and prostitution trade they’d spawned. Hepatitis A is transmitted through contact with feces from an infected person, and in close, unsanitary conditions, the highly contagious virus can spread explosively. So it was only a matter of time, experts say, before cases would surge among the homeless. Today, the tents are gone. There are clusters of newly installed portable toilets open and guarded 24 hours a day. More than 60 new hand-washing stations dot the city. Workers in hazmat suits spend mornings spraying bleach onto streets and sidewalks. Armies of nurses walk through encampments and even into riverbeds and canyons to offer the highly effective hepatitis A vaccine to homeless people. And on Monday, the first city-sanctioned homeless camp — with 200 four-person tents, security, showers, and bathrooms — is slated to open in a parking lot near Balboa Park. It’s an extraordinary campaign to control an outbreak that’s so far known to have stricken 481 and killed 17 here, mainly people who are homeless or drug users, or work with them. 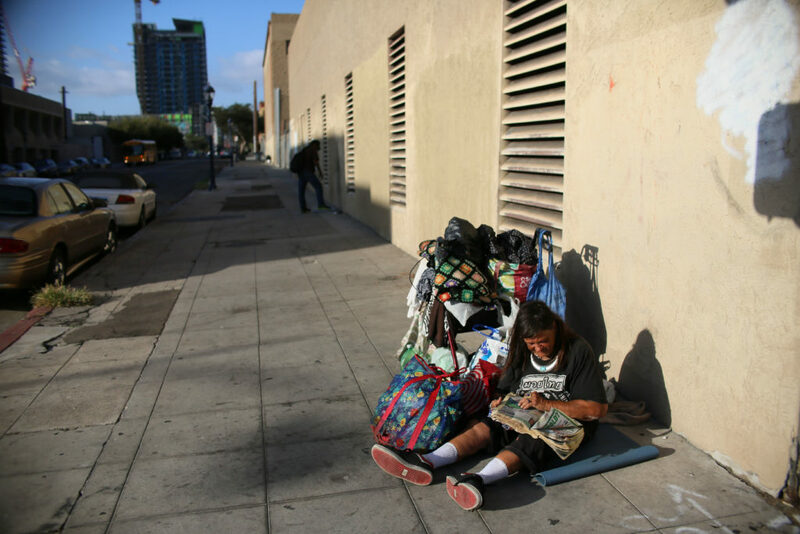 The city of San Diego had more than 5,600 homeless residents at last count, the fourth-largest population of any U.S. city, and many health officials fear the outbreak could worsen as new cases continue to surface. Doctors and nurses here are grappling with a population that’s extremely challenging to work with, or even find. Because homeless people are transient and receive little regular health care, even severe illnesses can go unnoticed and untreated for long periods. In the case of hepatitis A, this allows a carrier to keep spreading it. Issues such as mental illness and a deep culture of mistrust of the government also make many homeless patients difficult to reach or reason with. 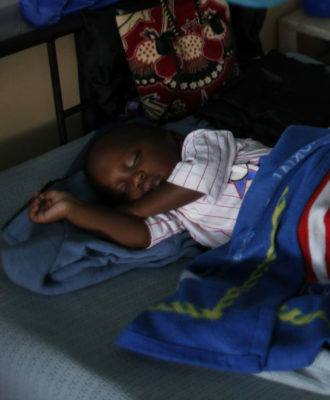 Many routinely turn away offers of free vaccines or medical attention. A woman with her belongings in downtown San Diego. A hepatitis A outbreak has killed numerous homeless people and sent hundreds to the hospital. The challenges became clear on Wednesday, when county public health nurse Paulina Bobenrieth and three fellow nurses set up outside a public restroom near city hall that’s often used by homeless people, and gently asked passers-by if they’d been vaccinated. They had plenty of takers; word has gotten out on the street about the outbreak and many are scared. “I come get a booster every month?” asked one man who’d been recently immunized. “No, just one time, in six months,” replied a police officer who specializes in homeless outreach and was accompanying the nurses. People sat before Bobenrieth, often parking carts filled with salvaged metal or sleeping bags, to roll up their sleeves. She gently cleaned dusty arms with alcohol wipes and administered the shots. The nurses kept an eye out for people who might be sick and need hospital care. “Have you been feverish? Do you feel nauseous?” Bobenrieth asked. But it was sometimes hard convincing people to go. One clearly sick man — “really yellow,” Bobenrieth said — refused to go to the hospital because he was worried about losing the recyclables he’d collected in his cart. A team member paid him for the recyclables out of her own pocket, but the man still refused to go. “You do what you have to do,” Bobenrieth said. That dedication is evident among more than nurses and doctors. Bobenrieth points to tiny Christina Huynh — homeless people call her “The Hammer” — a bathroom attendant who unlocks the doors, enforces the two-minute time limit, and, since the outbreak began, has been disinfecting the bathrooms three to four times during her shift. Overall, the county has vaccinated more than 54,000 people at risk of hepatitis — on the streets and at clinics, social service agencies, the central library, jails, and emergency rooms. The campaign has reached so many people that health workers find they are talking to many folks who already have Band-Aids on their upper arms. 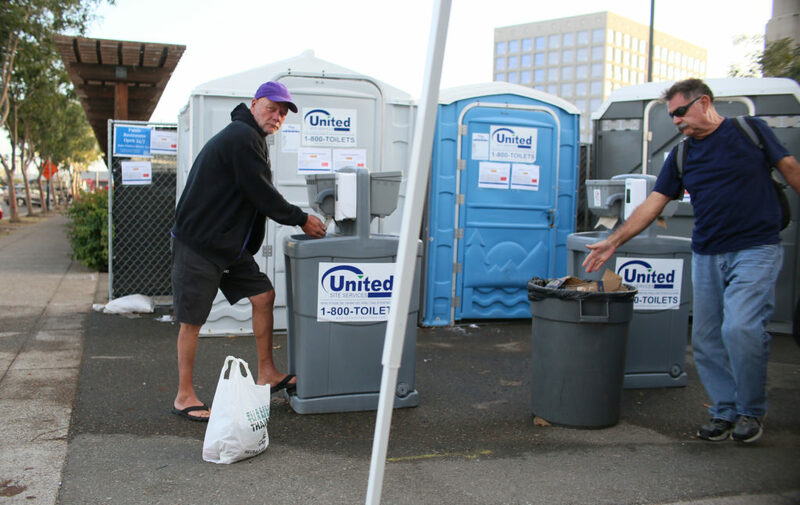 Portable restroom stations in downtown San Diego. While the conditions were ripe here for a hepatitis A outbreak, its arrival still came as a surprise. There have been very few outbreaks of the virus — other than a handful related to contaminated imported foods — since the hepatitis A vaccine became available in 1999, and fewer still since 2006, when it became a universally recommended childhood vaccine, said Dr. Monique Foster, a medical epidemiologist who runs the division of viral hepatitis for the Centers for Disease Control and Prevention. 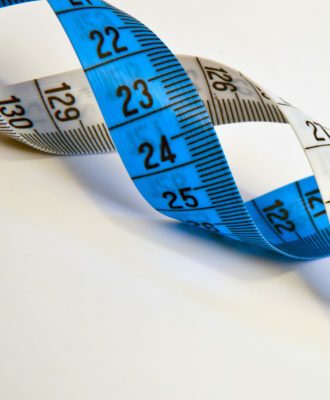 Though the virus does show up in the U.S. among travelers and gay men, hepatitis A, which is rarely fatal and does not cause chronic liver disease, has not been largely on the public health radar. 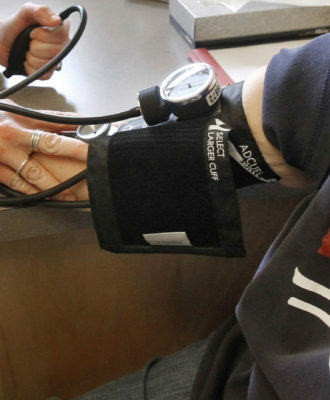 “There’s been so much focus on hepatitis B and C over the past few years, hepatitis A has been kind of the neglected virus,” UC San Diego’s Schooley said. The disease causes mild to serious illness and is spread by the ingestion of even microscopic amounts of infected feces. Symptoms include extreme fatigue, diarrhea, yellow skin and eyes, and urine so dark it looks like Coca-Cola. The San Diego strain is not the one typically found in the United States, said Foster, but is a strain called 1B that appears to be spreading here. It is not necessarily more virulent, she said, just hitting hard in an already weakened homeless population. 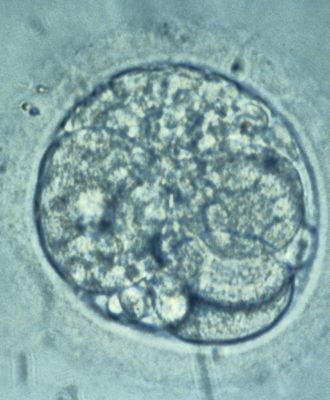 The virus has been challenging to stem because of its long, 50-day incubation period, meaning someone can be carrying and spreading it for weeks before it’s detected. The county is now seeing about 20 new cases a week, meaning the outbreak may have plateaued, but Wooten said she won’t be sure until she sees another month of data. Meanwhile, the outbreak has spread out of San Diego as infected people travel to new cities. Foster said the CDC has issued a nationwide public health alert because the same strain found in San Diego has sickened people in Los Angeles, Santa Cruz, Calif., and now a homeless shelter in Maricopa County, Arizona, and is linked to patients in Colorado, Utah, and Rhode Island as well. Wooten has been busy fielding calls from fellow public health officers around the country asking what they should do. 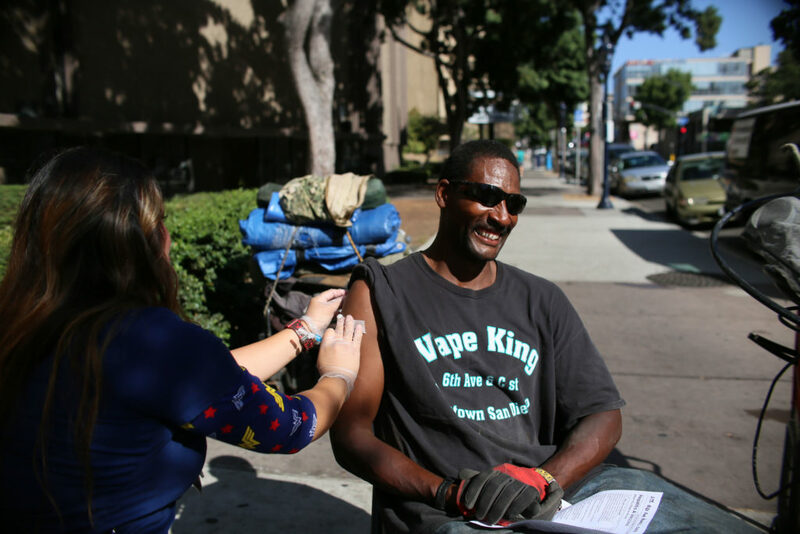 Nurse Cheri Cuatico gives a hepatitis A vaccine to a homeless man in downtown San Diego. Tammy was extremely weak, sick, unable to keep any food down, and “yellow as a daisy,” said her partner, Benjamin. But in some ways, things are worse now. Tammy and Benjamin and almost everyone else living in the long cluster of tents they used to call home have been jailed or kicked out, they said. On a recent night, she and Benjamin hovered a few blocks away, with their belongings neatly tucked into a shopping cart and their two dogs in a stroller. They warily watched for cops as they waited until dark so they could pop open their tent and climb inside with their pets. They planned to be up and out by 4:30 a.m.
Alvarez, a vocal critic of both Mayor Kevin Faulconer and county officials, has been urging the city to shelter the homeless in properties such as a vacant former public library, the old convention center, or the 160 acres of parking lots and shower-rich training facilities left behind when the San Diego Chargers moved north to Los Angeles. He’s worried that the rousting and cleanup prompted by the outbreak has forced homeless people into hiding in canyons, river beds, parks, and vacant lots — taking their belongings, as well as the virus, with them. 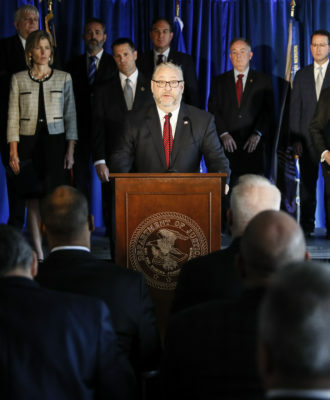 Michael McConnell is a local coin dealer who became a homeless advocate as he saw the homeless population increase year after year. He called the city’s response to the outbreak almost laughable and noted that there had been massive tents set up to shelter homeless people — until the mayor ordered them taken down in 2015. “They’re playing whack-a-mole with all these encampments,” McConnell said. “It’s totally a man-made disaster. They created an environment for hep A to fester.” Putting people in temporary tents is just a Band-Aid, he said, when efforts need to be made to get people permanently off the streets. The outbreak has led to a lot of finger-pointing between local officials and between city and county departments that are responsible for health, safety, and sanitation. The mayor has called his response immediate and comprehensive. Homeless advocate Michael McConnell walks the streets next to the camps in downtown San Diego. For the last four years, Jeannette, 69, who hails from Georgia and her husband, Benny, a former marine, have spent each night outside a collision shop. They haven’t been bothered, she said, because she keeps the sidewalk clean for the owner. Every morning, she picks up waste by hand and empties buckets of bleach onto the sidewalk. The outbreak may be bringing much-needed attention to such grim realities. 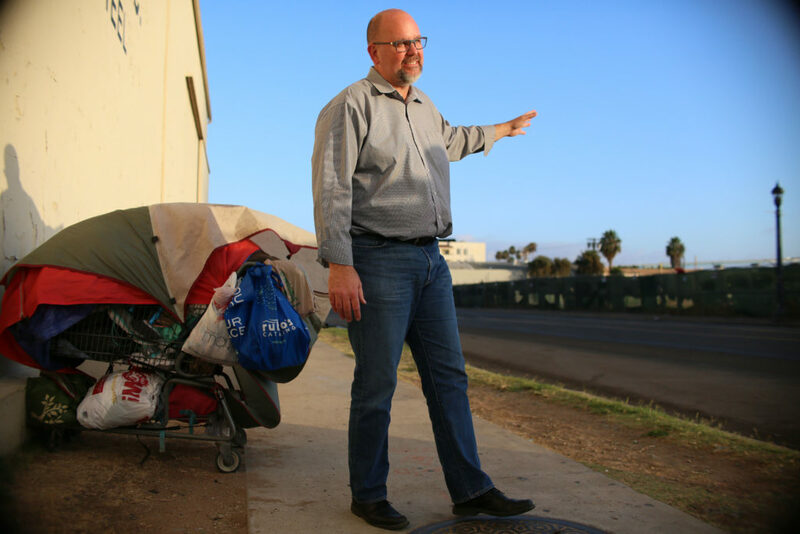 “This is a warning shot that homelessness is something we can’t ignore,” said Dr. Jeffrey Norris, the medical director for a health center embedded within Father Joe’s Villages, a charity that provides food, shelter, and medical care for San Diego’s homeless. How about right here in downtown Lynn and Lawrence?